Randy Schranz has watched or participated in every Pikes Peak Hill climb since moving to Colorado in 1959. He beganhis racing career in 1967, competing in the Rainbow Falls ice races in a 1955 Jeep pickup and drag racing through the late 1960’s at Continental Divide raceway. After serving as a crew chief for Marv Youngman while competing in the Stock Car class at the Pikes Peak for several years, Randy began his Hillclimb career as a driver in the 4X4 production class, winning the division in a Ford Bronco in 1972 and 1973 while following the path of his favorite drivers, Bobby Unser in the open wheel cars, and Nick Sanborn, Parnelli Jones and Curtis Turner in the stock cars. 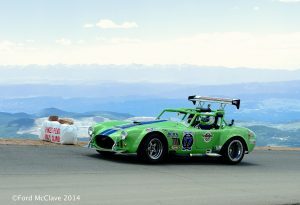 In 1974, Randy moved to the Stock Car division–the most competitive class at Pikes Peak–and was a consistent top five finisher for more than twenty five years. In 1999, he broke Roger Mears’ long-standing record for a propane powered vehicle, driving a Chevy Lumina Stock Car up the hill in 12 minutes, 48 seconds. The following year, his team built a Cobra kit car, again powered by propane, to compete in the Exhibition class. He not only set a class record that still stands, but competed for the 14 years with the car, setting standards and exhibiting the strength of propane as a power source. In 2014, members of Randy’s family, as well as friends and fellow members of the Hillclimb community gathered from five different states to celebrate Randy’s 40th, and last run up Pikes Peak. Today, Randy supports his son’s racing career as he reflects on his own accomplishments that include winning ten times in five different Hillclimb classes over a 40 year competitive career, and appreciating the friends and professional relationships formed through his commitment to Hill Climb racing. For his dedication and outstanding career, Randy Schranz was inducted into the Colorado Motorsports Hall of Fame with the Class of 2018.